Tiffany Ridge vacation cabin is an overnight vacation rental nestled in the foothills of the Great Smoky Mountains in Pigeon Forge, Tennessee. It is conveniently located and easily accessible on a paved road on a wooded hillside in a very quiet, secluded and non-crowded area. Tiffany Ridge has the advantage of not only being close to activities, but also is located on three acres for your enjoyment for complete privacy. The cabin definitely has location, location, location being only 1½ miles from the famous amusement park Dollywood and Splash Country and just three miles from the main parkway of downtown Pigeon Forge and Gatlinburg is a close scenic five miles away. Tiffany Ridge vacation cabin has sleeping accommodations for seven guests with three bedrooms, plus an open loft, (one king, one queen and three singles). On the main level is the living/dining room, kitchen, half bath, laundry area and he master suite, featuring a connecting bathroom with a huge jet Jacuzzi with wooded view. Upstairs there are two more bedrooms and an open loft with a pool table, plus a full bath. With 1,580 sq ft living area, this cabin has plenty of room for larger groups. Tiffany Ridge offers a fully equipped kitchen and linens throughout. The living room area features vaulted ceilings with a gas-log fireplace, HD TV, stereo with CD/MP3 player and free WiFi. You may melt away your cares with a hot tub on the deck (guaranteed clean, fresh water for every reservation) and jacuzzi inside, pool table, open loft, gas fireplace, two decks lined with rocking chairs and a beautiful view overlook a meadow with mountains beyond. Come to enjoy one or many of the activities in the area including the Great Smoky Mountains, hiking, outlet malls, excellent dining, fishing, Dogwoods in the spring, mountain biking, museums, autumn foliage, antiquing, skiing and snowboarding, live theaters, rock climbing, zoos, rafting, scenic drives, golfing and terrific Christmas decorations.....and that's just for starters! **Equipped with Carbon Monoxide and Smoke Detector alarms and Fire Extinguisher for your safety. Welcome to a wonderful vacation at Tiffany Ridge Vacation Cabin! Being originally from Florida I have enjoyed Tiffany Ridge Cabin located in the Smoky Mountains to the fulllest during every season -- spring, summer, fall and Christmas is fabulous. Whether it's a peaceful and quiet atmosphere you are looking for or being in the action on the main parkway in Pigeon Forge (within three miles) you will find what you are looking for here with these comfortable accommodations. Tiffany Ridge Cabin is located on three acres, and is set apart from other cabins giving you privacy for your own enjoyment, With a paved road to the front door there is easy access, yet only 1.5 miles from Dollywood/Splash Country. Tiffany Ridge Cabin welcomes you for a wonderful vacation! Tiffany Ridge Cabin was originally built by the owner in 1996 as a get-away from the summer heat, but now it is available for vacationers to enjoy the many activities in the area or to spend some quiet, relaxing time at the cabin. Location, location, location, being only 1½ miles from the famous amusement park Dollywood and Splash Country and just three miles from the main parkway of downtown Pigeon Forge and Gatlinburg is a close scenic five miles away. Historic Cherokee is located a couple hours over the mountain. Any season is a wonderful time to enjoy the area, whether summer or fall and Christmas is spectacular. Besides being located close in to the action, Tiffany Ridge has the advantage of being located on three acres for highest privacy. toilet, shower, jetted tub, bidet, Large jucuzzi with large window to wooded view. Soft water. toilet, combination tub/shower, jetted tub, Soft water throughout Cabin. On the main level the master bedroom features a full bath with jetted jacuzzi with large window with wooded view, plus a half bath off the hallway. Upstairs has a full bath. Tiffany Ridge is nestled in the foothills of the Great Smoky Mountains. Cabin phone: 865-774-0123; Local calls and long distance calls within the U.S., Canada and Puerto Rico are provided at no charge. All other calls, including Directory Assistance will be charged. One set of linens are provided for all beds. The kitchen also will have washcloths and kitchen towels. Washer, dryer, iron and ironing board are located off the half bath on main level. If you plan on using the washing machine, please bring your favorite soaps and dryer sheets. Located off half bath on main level. Fireplace features a floor to two-story ceiling rock work, cozy, clean and safe gas-log fireplace, operable September-April. Large paved parking area in front fo the cabin for four to five vehicles. Secure free WiFi and high speed internet service is available. There are enough towels provided for all guests, plus extras. Also hand towels and washcloths. Secure WiFi or high speed internet service is provided for all guests with login instructions at the cabin. Includes gas-log fireplace featuring floor to ceiling rock work, seating for five, flat screen TV, DVD, boom box stereo, MP3 player, windows to deck with meadow view and mountains beyond. A starter supply of dish soap and dishwasher detergent are provided. Cabin has soft water, so use dishwasher soap sparingly. A drip coffee maker is provided, but please bring your own filters - the basket-type filters. Place settings for eight plus, basic cooking utensils including toaster, hand mixer and blender. Kitchen has all cooking utensils, dishwasher, microwave, coffee pot, toaster and blender. The kitchen is nicely equipped, but if you plan on doing a lot of cooking you may wish to bring pots and pans and specialty cooking supplies. A starter supply of dish soap, dishwasher detergent, paper towels and toilet paper are supplied. You may also want to bring bottled water coffee, coffee filters, sweetener, favorite soap/shampoo and any other little items that are part of your daily routine. Basics are supplied, but for extended stays you may wish to bring additional supplies, or purchase locally. Dining area is open to the kitchen and living room areas and also within viewing of the TV. Living room flat screen TV with built-in DVD player. There are also TV's in the master bedroom and one guest room upstairs. Tiffany Ridge' cabin features ComCast as the source with one HD TV in the living room, one TV in the master bedroom and one TV in the queen bedroom upstairs. Includes CD/MP3 player. Bring your own connector for i-Pad or i-phone. Included in TV in living room and master bedroom. Just a little smaller than regulation size located in the open loft. Tiffany Ridge cabin features two covered decks, one with hot tub, and the other viewing meadow with mountains beyond, rockers, swing. There is also a child-size folding table & four chairs. There is a deck at the front door featuring a hot tub at the far end and lounge furniture. There is a private hot tub on the deck ( and guaranteed fresh water with each reservation. We stayed a week for spring break with our two small children and it was wonderful, close to everything but far enough away to enjoy the quiet and nature. We heard coyotes at night and there were bear prints around the cabin one morning. A quick ride to Dollywood maybe 5 minutes and depending on traffic could get to Gatlinburg and Pigeon Forge in about 20. Probably less busy otherwise and even faster. Cabin was very comfortable (great beds), lots of supplies in the kitchen and plenty of space for our family of four. The bathrooms were clean and had plenty of space for everyone and nice to have a tub for kids bath times. The views were great out the front porch, some neighbors you could see but still plenty of space and privacy. The driveway has only one switchback and we got through it in our midsized suv just fine. The road was wel paved and the house was easily accessible. The hot tub was a nice treat after long days walking or hiking. The cabin was clean except for some dead bugs along window ledges and an exhaust fan in the bathroom downstairs being dusty. Otherwise the cabin was very well maintained and cleaned. The one green couch in the living room was a tad uncomfortable and found the plywood board underneath it as mentioned in another review so perhaps time to replace it. Sitting on the front porch looking out at the views was fantastic and the cabin was in a very good location. Sometimes you can hear the birds up at Parrot Mountain which is a fun way to spend an hour or two and literally a few minutes drive away. The cabin was was a fantastic getaway for the week and the next time we are back would definitely book this place again. Thanks so much for your great review! I am so happy that you had a great time. Please come again! PS The green couch - well actually it was an unusable and uncomfortable hide-a-bed so to prevent guests from trying to use it, we made that part unavailable. We will review it all when we are there soon. Thanks for the comment. Had an issues an owner was fast acting resolving it. Beautiful sceneray. We could not have enjoyed our stay more, thanks again for allowing us to stay in your fantastic chalet! Thanks so very much guests! Please come again and enjoy all over again! Thanks so much guests - please come again when you can and enjoy Tiffany Ridge Cabin all over again! This is a lovely cabin & at Dollywood's front door, without the traffic! We enjoyed sitting on the back porch drinking our coffee & admiring the beautiful view. The first morning we looked out over the balcony.....hoping to spot a bear! Nope, it was cows!LOL My sister & I were raised as farm girls, so this was a nostalgic moment for us. We loved the mooing cows in the mornings, as we drank our coffee. They are down in the valley & fenced in, so not to worry, if you don't like animals! The cabin is beautiful inside & out! You will not regret renting this piece of tranquility. It is off the main highway, but close to anything you may want to do. We enjoyed the Hatfield & McCoy dinner show. We sat at the long front table near the stage & my sister & niece were asked to be part of the show. Hilarious to watch them as part of the act! The Old Mill restaurant is ALWAYS a favorite located in Pigeon Forge. It is only five miles to Gatlinburg or you can ride a trolley into town. So much to see & do! Parrot Mountain is located on the road to the cabin. We didn't fit it in this time, but hopefully we can do it next time & would love to stay at this cabin again! We had a wonderful time! Thanks so much and so glad you enjoyed Tiffany Ridge Cabin and had a pleasant place to return to relax after a day of excursions. I am featuring your review on my listing. Thanks again! Come to enjoy one or many of the activities in the area including the Great Smoky Mountains, hiking, outlet malls, dining, fishing, mountain biking, museums, autumn foliage, antiquing, skiing and snowboarding, live theaters, rock climbing, zoos, rafting, scenic drives, and golfing. 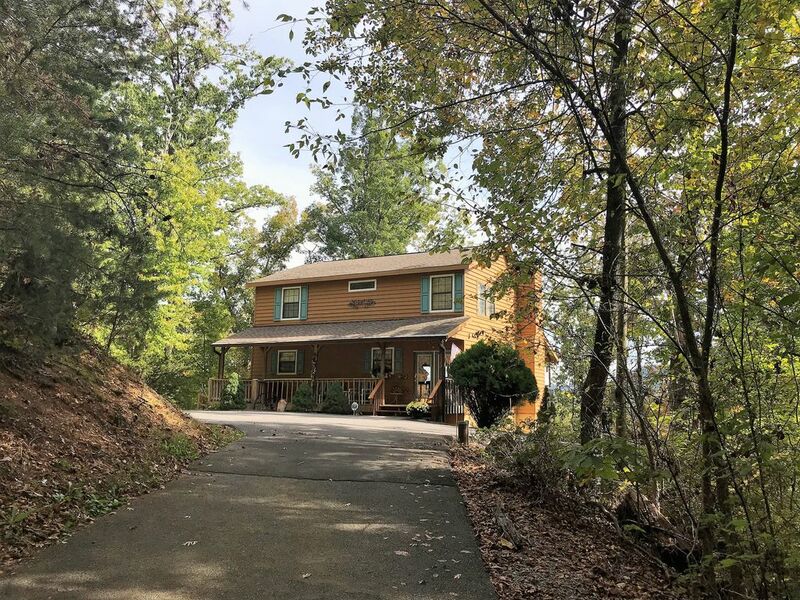 Tiffany Ridge cabin is conveniently located and easily accessible on a paved road on a wooded hillside in a very quiet, secluded and non-crowded area on three acres of property, yet only 1.5 miles from Dollywood and Splash Country (via paved country roads). The cabin is just three miles from the main parkway of downtown Pigeon Forge, Gatlinburg a close scenic five miles away and very close access to the Great Smoky Mountains (33 miles) and Cherokee. McGhee-Tyson National Airport is 38 miles from the cabin. All other attractions and events are also easily accessible from our location. A four night minimum reservation is required during any holiday time. January - March: Inquire about specials. Cancellations made until 30 days prior to reservation will receive for a 75% refund; if canceled within 30 days of the reservation date, all refunds are forfeited. International credit card fees to be paid by guest.